The experience was memorable and will count with other adventures like hang gliding with Honi in Alaska in 1973 when we introduced the sport to the last frontier. I look forward to getting the grandkids on the river. 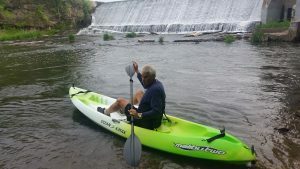 Mrs. tVM ingeniously figured out how to attach the kayak on top of the Escape for the 3-mile ride to the river where I launched from Glen Park at 7 AM just beneath the dam. The fact that the sky was cloudy and the temperature a bit chilly in the mid-50’s did not affect the equation other than to spark the imagination with thoughts of doing it again on a sunny day with warmer temps. 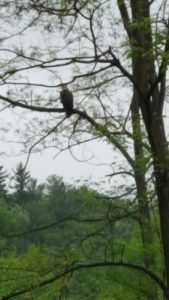 I was wet and cold when I climbed from the river 2 hours 40 minutes and 12 miles later at the bridge on Highway F. My shoulders were a bit sore, but my spirits soared with the Bald Eagle I communed with midway through the adventure. 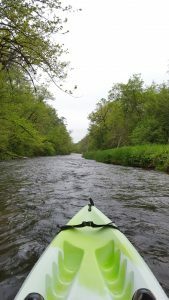 Through nearly three hours, I encountered one human – a fly fisherman – a deer, muskrat, the bald eagle, many Great Blue Herons who share the river with Canadian Geese and Mallard Ducks, too many songbirds to mention and countless trout rising for the gnats that dared fly too close to the surface of the water. learned quickly that it is wiser to keep both hands on the oars to maintain a true course and balance as I negotiated my path through them. While the trip was filled with many highlights, the single most impressive was SOUND! There is ZERO noise pollution on the Kinni when one travels solo on a day when other kayakers choose to stay at home. 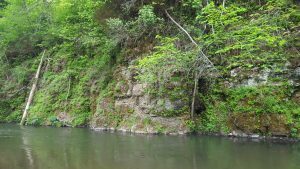 The sound of the river is magical and the small streams that fall a hundred feet from the limestone cliffs on the bottom half of the river add unimaginable harmony to the main theme that the river plays. Birds sing joyously and with abandon. Geese and ducks allowed me to pass by showing no alarm. It is their home and I respect them. They made me a part of their peaceable kingdom. Gene, I cannot wait to join you! I felt like I was on the water with you. Way back I went with a group of students from the U. of Alabama more than one time down the Chatuga River of Deliverance fame. I fell out of our craft once and thought I was going to drown as the water rushed over me. I prefer the solo experience. That is why I was on the river early in the morning. On weekends, there are many kayakers on the Kinni, which creates a different environment than the one I was blessed to be a part of.